traditional lifting equipment and pneumatic manipulators featuring pneumatic control. The industrial manipulators Liftronic® Series better referred to as INDEVA®s (Intelligent Devices for handling) belong to the class of manipulators worldwide known as “Intelligent assist devices (IADs)”. Compared to the traditional pneumatic manipulators, offer significant advantages related to Ergonomics, Safety and Productivity. Auto-weight sense and automatic load weight balancing. By means of a microprocessor based electronic device the system automatically and instantly balances the load weight; it doesn’t merely balance the load weight automatically (auto-balancing feature), but it also senses and balances the load weight continually (auto-weight sense feature). Thanks to this feature the operator can handle loads that change their weight while being handled (e.g. : drum, cases, bags etc.. being emptied or filled), or loads with different sizes and weights without interrupting his handling operations for adjusting load settings or selecting a different pre-set load parameter by means of push buttons or pressure regulators. The operator can handle loads in a natural and intuitive way almost forgetting he’s using a machine. Counter balancing is much slower because it takes much longer for pneumatic signal, to travel around the circuits compared to electronic signal. High precision in load placing. With considerably more speed and precision than a traditional pneumatic manipulator, an INDEVA® allows for unsurpassed precision, where the operator will intuitively work at the pace best suited to the task. The operator has exceptional control with the lightest of touch needed. The INDEVA® industrial manipulators distinguish themselves form the pneumatic industrial manipulators because don’t over travel, nor bounce and don’t require lots of little corrective movements to reach the required position. The float mode function (hands on the load) allows operators to perform precision placement tasks with their hands on the load itself for maximum control with no need to use handles or to press buttons; this mode is very useful especially when load has to be placed in a restricted area or for delicate loads that could be affected by typical bounces of pneumatic control manipulators. With the Indeva Liftronic Series industrial manipulators, the fingertip control mode by means of a force sensing handle, provides immediate response to the operator’s moves up and down. This drastically reduces starting, acceleration and deceleration inertia forces, thus allowing the system to operate as an extension of the operator’s arm. The effort required to the operator for moves along the Z axis is constant and almost null; this feature, together with their ergonomic design make the INDEVAs the only available material handling solutions that really comply with the strictest regulations and directives on ergonomics and safety in the manual load handling. Lifting tools used for the INDEVA® industrial manipulators are much lighter and more compact than those used for traditional manipulators and allow for greater visibility and ease of maneuverability. 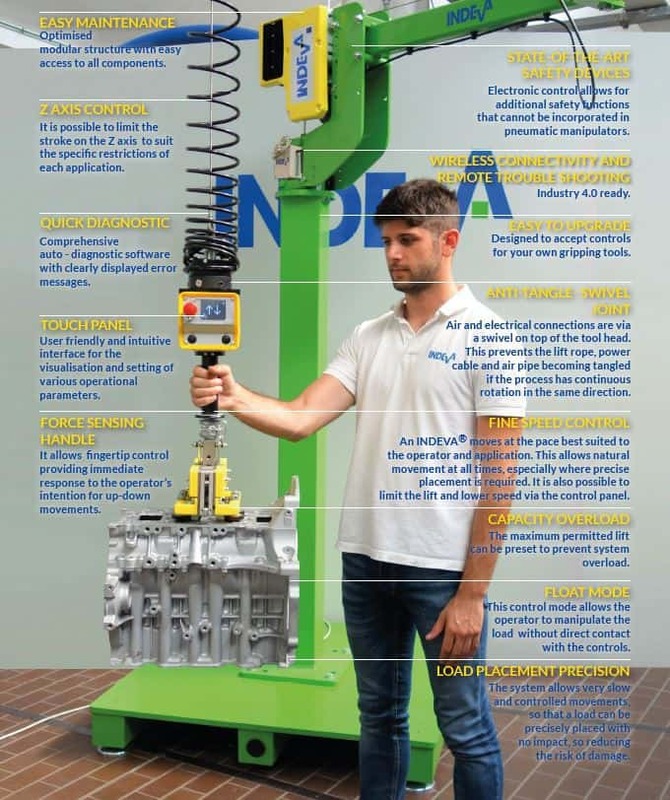 The INDEVA® Industrial Manipulators Liftronic® Easy Series can be equipped with a gripping tool quick coupling device by means of which it is possible to change quickly and easily different end-effectors and handle different types of loads with only a 15 seconds work interruption. Modifications to load handling parameters or end-effector functions are very easy to carry out via electronic software (much simpler operation compared to changing the pneumatic circuits of pneumatic manipulators). This is especially important in case of special end-effectors with multiple functions. 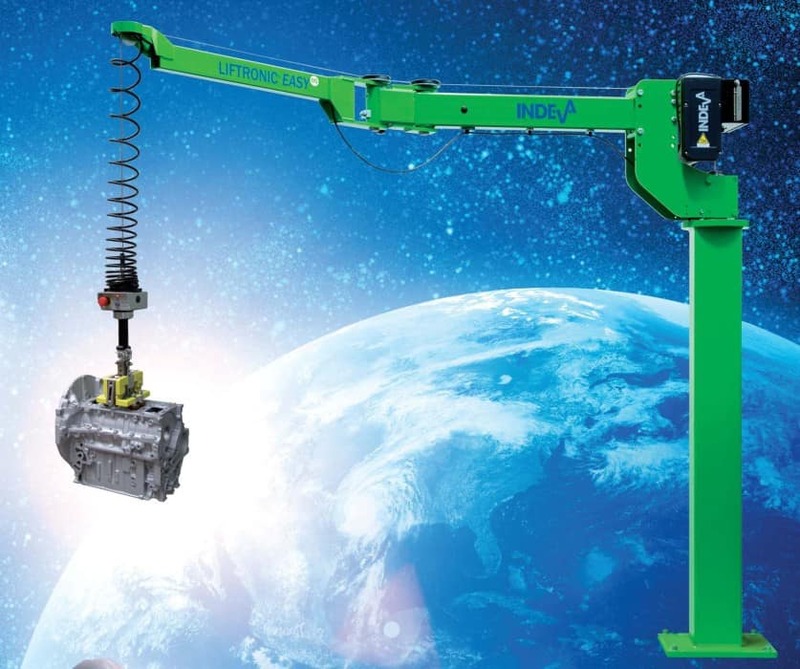 Our modular gripping tool concept “MODULO” and the microprocessor programmable logic make the LIFTRONIC® Series manipulator a unique load handling solution that matches demands in every industry field. Using an INDEVA, output can be maintained throughout a full shift giving increased productivity and operator wellbeing. State-of-the-art safety features prevent movement unless an operator is present and in control. Should a power failure occur, the motor is held with a mechanical lock and the load cannot be released until power is restored, or the full weight of the load is supported. An INDEVA® can be connected via Wi-Fi to App-Indeva, so that machine data can be transferred to a remote tablet or smartphone in real time. This can assist fault diagnosis, so significantly reducing call-out charges and operator downtime. Low carbon foot print thanks to efficient and low energy consumption. A recent case study by the Engineering Faculty of the Brescia University and published by the International Journal of Industrial Ergonomics, together with a comparison study carried out by the University of Milan proved how the use of an INDEVA® satisfies current industry demand for increased productivity combined with improved ergonomics and safety. In applications which require speed of handling, fluid movement and precise load placement, the INDEVAs- Liftronic® Series provide a perfect solution.